This safari takes you to the renowned Murchison Falls, Uganda’s spectacular heritage, with breathtaking scenic allure, and landscapes. Visit Ziwa Rhino Sactuary to track white Rhinos, You will enjoy a game drive and a boat cruise along the Nile River and observe the squeezing of the Nile River in a 7 meter gorge before tumbling 40 meters down in a thunderous explosion and then flows down into a very peaceful river whose water banks are swarmed with a profusion of water and land animals as well as birds. 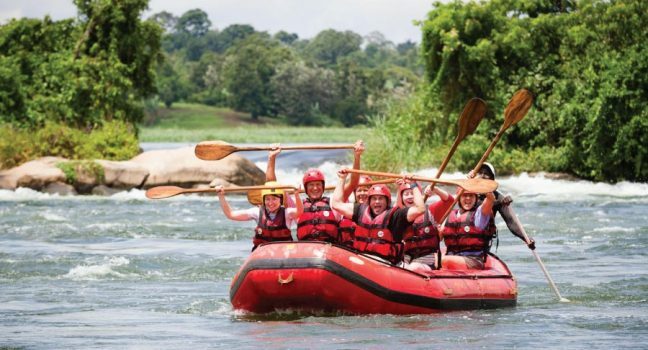 You will relocate to Jinja to visit the source of the Nile River and to participate in the white water rafting adventure. Visit the Equator as well on the last day. You will after breakfast set off for a 2 hour drive to the Equator where you will reach around 10 am, At the Equator you will have an opportunity to stand in 2 hemispheres at the same time and take some photos. Afterwards you will have for lunch at the Equator later travel back to Kampala and later on Entebbe Airport to catch you’ flight back home.